I had heard that Leids Ontzet was something that I simply had to experience. Having been in Leiden for three months, I’d grown used to how quiet this city is a lot of the time, so I couldn’t imagine what it might be like in the midst of a massive city-wide party. In fact, 3rd October turned out to be even bigger, wilder, and louder than I imagined. There were some signs the weekend before that 3rd October would be big. The fair was the first obvious indication – huge rollercoasters and a ferris wheel began going up around the Beestenmarkt, along with various trailers that seemed to hold yet more fairground rides. This fair opened on the 2nd October, and we spent an afternoon wandering around, already seeing more people out in the city centre than ever before, even compared to Saturday-afternoon Haarlemmerstraat levels of busy. In spite of the intense crowds, a couple of oliebollen (aka delicious little balls of warm sugar and fat) were enough to convince me that this was not – as I had first thought – a trashy event, but a glorious celebration of Leiden and its history. Admittedly, more people saw this as an excuse to be drunk for 24 hours, as I quickly realised, but it felt celebratory all the same. night of the year, if you walk down to the Stadhuis after 8pm it’s largely deserted, just a few people braving the cold to have a drink on the terrasjes outside cafes and bars. Now though, the two sides of the Nieuwe Rijn were packed with more people than I ever expected to see in this little Dutch city. We stayed out long enough to sample the atmosphere and then headed home, eager to enjoy tomorrow all the more. We awoke on 3rd October to the sound of drums and trumpets – evidently, this was the soundtrack to the annual haring giveaway we could hear. We emerged later on to another busy Breestraat, and found a place to watch the afternoon parade. This was clearly a family orientated affair – all the children in the vicinity had the day off school, and were perched on their parents’ shoulders to better see the various characters that went by. Most of this was good fun, however, I did wonder how the scantily clad Brazilian dancers had managed to dance for a full two hours in the cold with only feathers for warmth. There were some signs that maybe I was little too old for this – as someone who doesn’t drink a great deal, the drunk antics of middle-aged Leideners were more frustrating than amusing. Nevertheless, it was memorable, and for a day I felt like a true Leidener. 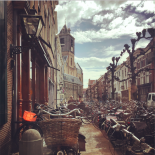 This entry was posted on October 8, 2017 by Abigail@TheLeidener in Uncategorized and tagged international student, leiden, leiden university, leidsontzet, netherlands, Student.